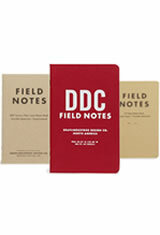 The Field Notes Tenth Anniversary edition comes in a 3 pack celebrating 10 year of Field Notes. Each of the three notebooks are replicas of different Field Notes editions. This notebook has a red leather texture cover designed by creator Aaron Draplin. It was also the first use of the name "Field Notes," and the first use of the horizontal Futura Field Notes logo. This anniversary edition has a matte foil in white on red Mohawk Carnival 90# cover stock. The interior is 32 blank Finch Opaque 60# sheets. Aaron's first printing was slightly taller and narrower than the modern Field Notes. These were each hand printed and hand bound and numbered by Aaron himself. The reprint version is the current 3-1/2" x 5-1/2" size. Each notebook has a French “Speckletone Kraft” 100# cover and 32 pages of 60# Finch Opaque paper printed with a simulated old-school graph paper. In Late 2006 Aaron printed a few more runs for himself and friends. He then sent some to Jim Coudal of Coudal Partners and the Field Notes Brand was born. This recreation are so close they are hard to tell apart from the originals. They feature a 80# French Packing Brown Wrap cover with 60# Finch paper printed with light gray graph paper and the Field Notes logo atop each page. The Field Notes Tenth Anniversary Memo & Notebooks usually ships within 1 business day unless otherwise specified. Each Field Notes Tenth Anniversary Memo & Notebooks we sell is guaranteed to be genuine, authentic and will arrive brand new & unused! The paper takes ink surprisingly well, for Field Notes. I love the red notebook style. The ruling on the top notebooks is a bit too big of a graph, and is very dark. The final book is so close to standard kraft field notes that it’s a bit boring. Honestly, this pack is worth picking up for the red book. Each book has 32 pages, which makes them more pocketable than normal. I use these for personal notes because of the fewer pages, rather than work notes.